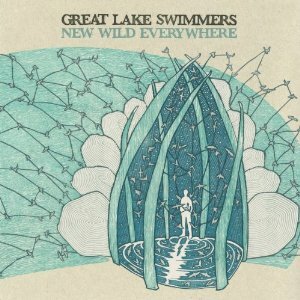 New Wild Everywhere is Great Lake Swimmers’ 5th album and it follows the Polaris Prize shortlisted Lost Channels. No pressure, right? Actually, songwriter Tony Dekker was energized, “We wanted to try something new…and flex a bit of the creative muscle we’ve built up through [the] years.” And wait for it — this album was recorded in a studio! No extension cords, boat rides, or island destinations. However, they did record “The Great Exhale” in the Lower Bay station in Toronto’s subway tunnel. The album features Erik Arnesen on banjo and guitar, Bret Higgins on upright bass, Greg Millson drumming, and Miranda Mulholland joins with vocals and mad violin skills. For fans, this album doesn’t depart from the deep thoughts masquerading as nature thoughts set to beautifully orchestrated music, with lovely hooks gently pulling us in (for the unfamiliar, think Fleet Foxes). This album is a journey continued from Lost Channels, keeping us floating along. “The Knife” has one of our favorite comments on the stability quotient of lovers. Shockingly, “Easy Come, Easy Go” is an up-tempo song that you can actually tap your toe to. For hope and optimism, the title track is also suspiciously upbeat, but sweetly so.